Why can't I purchase unlimited gas? Is it because of the current events? I normally get the gas and xp combo going but now i dont see the gas option. But hsve already got the xp boost. Its because the 1 minute gas is about to start. Yes, but who is on a 23 gas challenge? There are no repeatable challenges this time (that I can tell). The raider might be able to if you get lucky. But the fact you have to kill evey walker means they won't be repeatbale. And even if they are, it will probably take 20+ minutes to do it, so therefore you wouldn't need the gas. You could argue you could do a few 6-7-8 gas exploration missions in a few minutes. I would still like to purchase unlimited gas. 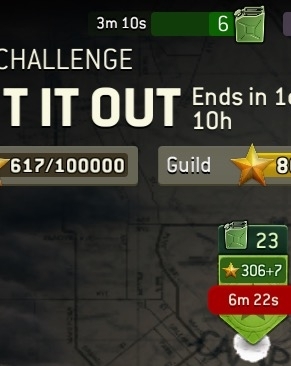 I would be able to do sub missions for xp. @blynknz back alley atm. u would understand once you tried it and know there is a repeatable challenge. plus it only takes 2 mins per challenge. and it doesnt always have to be the walker helping you out. just be smart and tactical bout it. Ok, I mist be doing it wrong. I would love to see a video of someone running this one at a high level. It's certainly the map I play over and over but it's currently taking all three of my survivors to kill 1 walker and I've only got 60+ stars on it. "Everyone has a plan, until they get punched in the face"